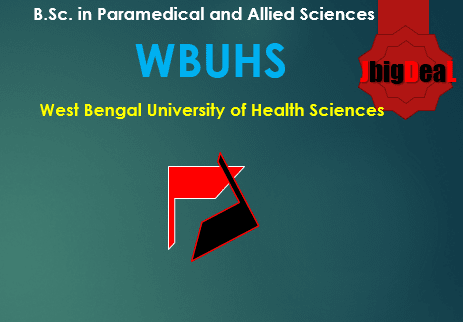 Download WBUHS Interview call letter / Admit Cards to be downloaded on 13.08.2018 for the admission in B.Sc in Paramedical Sciences/ Allied Sciences 2018 West Bengal. Admission test for filling up the seats in the “Three year Under Graduate Courses”, from the citizens of India to be conducted by the West Bengal University of Health Sciences (WBUHS) shall be made on the basis of admission test to be conducted and inter-se merit list of different categories/ castes of candidates. The interview will be based on common aptitude acquired at the Higher Secondary Level. Candidates will require to bring the admit card, the personal ID proof, a copy of qualifying examination/ pass certificate. a. An admit card will be issued for the interview/examination. Candidate will bring a copy of testimonials as mentioned in clause 12 that will follow the interview/examination during counselling. b. Interview / Written Test will be conducted as per schedule enclosed by the WBUHS to prepare category /caste-wise merit lists of the eligible candidates seeking admission to these courses. c. An applicant for admission will be provisionally allowed to appear in the test provided she/he has submitted her/his applications in the prescribed form with requisite fees etc. and has fulfilled the eligibility criteria outlined above.